Product Details-Post wrapped in natural Sisal Sturdy base wrapped in soft gray, Compare with similar items. Product Information-Trixies parla scratching post will provide endless opportunities for cats to play, explore, scratch or just relax. 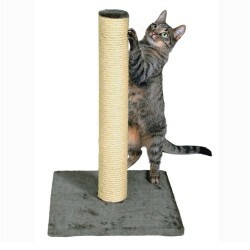 Felines can sharpen their claws on the scratching post instead of on your furniture or carpet, giving them a healthy outlet for their scratching instincts. The post is covered in durable sisal. The plush covered base is perfect for stretching out or catching a quick catnap. The subtle neutral tones are easy to integrate into your home dcor. Dimensions 16 by 16 by 24-Inch. Weight 7-pound. Color platinum gray. Suitable for cats of all ages and activity levels. One year warranty.